An Arab League ministerial delegation arrived in Gaza on Tuesday to express solidarity with the under-siege territory. The delegation was headed by Arab League Secretary-General Nabil El-Arabi and included more than ten foreign ministers from the region. Also joining the delegation was the foreign minister of Turkey whose prime minister was in Cairo for a bilateral visit. The short visit came after several Arab delegations had already been to Gaza to show solidarity and call for an end to the bloodshed. An extraordinary Arab League foreign ministers meeting convened for a few hours in Cairo on Saturday and asked for an end to the bloodshed without offering any concrete plan of action. According to the diplomat and others who took part in the meeting on Saturday, no serious proposals were put forward on how to handle the Israeli aggression. They added that ‘ceasefire’ was used by almost every speaker. Egypt and Qatar took the lead in this respect. “Nobody spoke about supporting resistance or any of this. Forget about the public discourse that is designed for political consumption. Everybody was keen on a ceasefire,” said the Arab League diplomat. He added that the Palestinian file is not a priority for any of the regimes, especially not to the Arab Spring countries which are suffering acute economic problems and internal political challenges. This said, Arab and Cairo-based Western diplomats agree that the collective Arab approach towards Palestine had been altered in style. The prompt Egyptian decision to summon Cairo’s ambassador in Tel Aviv and the visit of Egyptian Prime Minister Hisham Qandil to Gaza on the second day of the Israel aggression was the highlight of that change. “In the past Egypt and Saudi Arabia used to take the lead in blaming Hamas for its miscalculations. This is no longer the case. The change is essentially on the side of Egypt and it enforced a change, at least during the (Arab League) meetings, on the positions expressed by Saudi Arabia – and to an extent also on Jordan,” the same Arab League diplomat said. At the meetings this week, the Arab League did not go as far as a 2001 Arab League meeting that actually announced, rather than threatened to announce, a suspension of all forms of Arab-Israeli relations. “That was the only one time this happened. At the time, Amr Moussa had just taken over at the Arab League and he wanted to introduce a change. But his plans were aborted by the Egyptians who were supported by the Saudis, Jordanians and others,” the same diplomat explained. He added that the Egyptian delegation did not pursue anything beyond a condemnation of the aggression and call for end of hostilities. “We have gone the extra-mile [this time]. 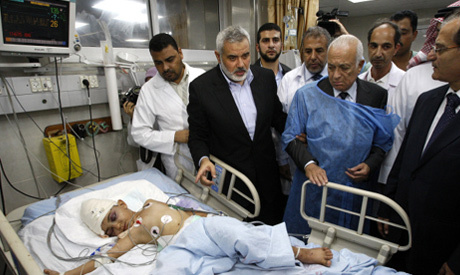 We immediately summoned the ambassador (from Israel) and sent the prime minister to Gaza the following day. But we also have to be careful because we have so many worries,” said an Egyptian government official. The Israeli aggression in Gaza started while Egypt was busy negotiating a loan with the IMF and while it was trying to curb the dominance of Jihadist Islamists in Sinai. On both matters, Egypt has serious matters to settle with the US. “We are keen to keep good relations with the US. We are not going to get into a fight with the US,” the same government official said. Tunis, whose foreign minister was in Gaza on the third day of the aggression, is not prepared to take unplanned positions. During the Arab League meeting earlier this week, the Tunisian delegation stressed the need for humanitarian relief and for a collective position to support the right of Palestinians to end the suffocating five-year siege on Gaza. Arab diplomats say it is not just the Arab league member states that are opting for a “well-calculated policy.” Turkey is doing the same thing by calling for a ceasefire and humanitarian assistance. In his remarks during a joint Arab-Turkish press conference in Gaza, the Turkish foreign minister condemned the Israeli atrocities in Gaza and insisted that history would not forget them, but said nothing about an escalation by Ankara. A Turkish diplomat, who spoke to Al-Ahram Weekly from Ankara, suggested his country was considering offering an ease in its relations with Israel to encourage the Israeli government to pursue a gradual lifting of the siege on Gaza. “You do what pays off,” he said. In Gaza on Tuesday, the Turkish foreign minister said his country would continue to work to end the siege on Gaza. Arab diplomats agreed that it was still an open question whether this change in style rather than content by Arab League member states would force a significant change in Israeli policies on Gaza, or the wider Palestinian file. Indeed, during the visits of Arab officials to Gaza this week, Israel did not fully suspend hostilities. And according to Cairo-based Western diplomats the Israeli decision to delay, if not fully cancel, a ground attack on Gaza was prompted by the Americans and Europeans, not by the Arab reaction. The Arab league should call for and impose a no fly zone over Gaza to protect its civilians. Egypt Air Force is capable of imposing this upon the cowardly brutal racist state of Israel by itself or with other member states.